Life can get quite crazy sometimes. Even as a stay at home mom, I am quite busy and frequently find myself spread far to thin. There seems to never be enough time for all the things that are important to me. I find it difficult to cope sometimes. Getting the chance to review Amish Peace was a blessing, as it helped me put several parts of my life in perspective. The book is divided into five parts: Simplicity,Time, Community, Forgiveness, and The Sovereignty of God. Each section is filled with stories, information from the author's many visits to Amish communities, and Amish traditions. THese folks are so wise and at peace, getting a peak into their world is such a treat. You feel as if you are part of this book, listening to them tell their tales, beliefs, values. It really gives you a lot to think about. 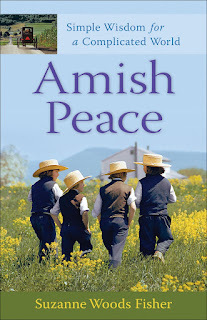 I highly recommend Amish Peace. May the stories and insights found in these pages bring some peace into your life. The book sure made me think about the way we live and has helped me get some priorities straight. It is a fascinating read, one that you should take slowly and really mull over as you are reading it. I hope you enjoy it as much as I did.